A Keyword is a word that people can text to your Shortcode (i.e. - 970-00) to join one of your Lists in your Clearstream account. Keywords can be any combination of letters and numbers. A Keyword should be short and easy to type on a mobile phone. Keywords are not case sensitive, but are space sensitive. Keywords do not store subscriber data. Only Lists store subscriber data. Therefore, Keywords can be created or deleted without deleting the subscribers who joined via that Keyword. Keywords don't necessarily have to opt the person into a List. They can also be used to trigger a one-time auto-response message. Keywords can also be used as an Automated Workflow, which is perfect if you're looking for a way to automatically follow-up with 1st-time guests. Click "Create Keyword" from the Keywords page. Choose your Keyword name - it can be any combination of letters and numbers. Not all Keyword names will be available. With our standard plans, your account has access to one of our shared Shortcodes, meaning that other churches are using the same Shortcode as your account. 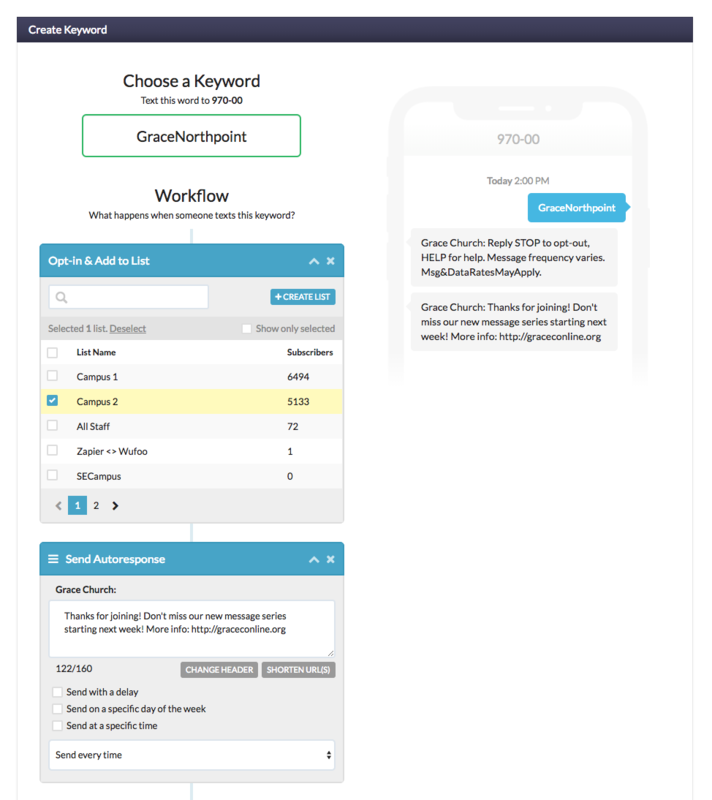 Only Keywords that haven't been created by another church will be available. Select which List(s) this Keyword will be tied to - this step is not necessary if you only want to trigger a one-time auto-response message without opting people into a List when they text your Keyword. Create your auto-response message - this is the message people will receive when they text your Keyword to your Shortcode. Send with a delay - send this auto-response message with a timed delay instead of immediately. Delayed auto-response messages are typically only used after the 1st auto-response. Your initial auto-response message should almost always trigger immediately after the Keyword is texted. Send on a specific day of the week/time - send on the following ***day. Example: you've set this to Wednesday at 4pm. Someone texts this Keyword on Monday, they will receive this auto-response message the following Wednesday at 4pm. How often to send - by default, the auto-response message will send every time someone texts the Keyword. You can change this to send on specific conditions: only the 1st time Keyword is used, when the Keyword is used after the 1st time (alternate auto-response message), only to new subscribers, or only to existing subscribers. 5. Create additional auto-response messages. You can create as many additional auto-response messages as needed. This is typically used as an automated workflow. ie - a person texts the Keyword, and they receive a set of specific, timed messages.